Electric vehicles are a 'big deal' for Chrysler, executive says in an exclusive interview. Chrysler's first extended-range electric car could be a Jeep Wrangler Unlimited like this. Chrysler promises that it will be fully off-road capable. NEW YORK (CNNMoney.com) -- Chrysler is pinning a huge part of its future on a plan to produce a full line of electric vehicles, at a reasonable cost to both the carmaker and the consumer. Chrysler's strategy hinges on keeping it cheap. The carmaker will dispense with flashy designs in exchange for low cost and flexibility. And it plans to pile on more electric-powered models quickly once the program launches in 2010. "We aren't a one-electric-vehicle company," Lou Rhodes, Chrysler's vice president for advanced vehicle engineering, told CNNMoney in an exclusive interview. Rhodes is also president of Chrysler's ENVI, a separate business division tasked with bringing new electric vehicles to market. Instead of making one, or just a few, electric-only models, Chrysler will sell the same models in both gasoline-powered and electric-powered versions. This low-cost, high-variety electric-vehicle strategy will play a big part in any comeback plan Chrysler may present in hopes of getting government rescue funding. Chrysler's strategy substantially cuts costs, Rhodes said, and it reduces the risk of entering uncharted market territory. That will translate into lower costs and more choices for customers. If gas prices stay low, Chrysler factories will produce more gasoline powered models. If gas prices rise, factories can start rapidly turning out more electric cars since the models are essentially the same. Chrysler's first electric vehicles will be based on current vehicles. The carmaker hasn't yet announced what the first model will be but, based on prototypes Chrysler revealed in September, it will likely be a minivan, a Jeep Wrangler 4X4 or a 2-seat sports car built in a Lotus body. At least some of Chrysler's products will be extended-range electric vehicles, like GM (GM, Fortune 500)'s Volt. Because the car's body will not have been designed around optimal weight and aerodynamics, the Chrysler vehicle will need a more powerful electric drive system to provide performance similar to the Volt's. For instance, Chrysler promises the same 40-mile all-electric plug-in range as the Volt. (After that, a small gasoline engine will start up to produce more electricity as the car drives.) But the heavier Jeep prototype has a 27-kilowatt-hour (KwH) battery back compared to the Volt's 16 KwH pack. Chrysler's second-generation electric vehicles, which the carmaker plans to start rolling out between 2012 and 2015, will be engineered from the wheels up to use either gasoline or electric power. 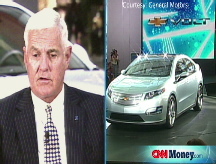 No matter which drivetrain the customer chooses, the vehicles will not be compromised, Rhodes insists. "If you know what you want to achieve up front, you can certainly design that flexibility in up front," he said. Electric cars will not have useless transmission tunnels running along the center of the floor, he said. If a rear-wheel-drive gasoline car needs that, a different floor will be used when that version is built. The electric power systems are also being engineered for maximum flexibility, Rhodes said. Bigger, heavier vehicles take more power to move, whether that power is from gasoline or batteries. For gasoline-powered cars, engineers have to design larger and smaller engines for different uses. A small Jeep Compass, for instance, gets a 2.4-liter 4-cylinder engine while a Jeep Commander SUV can come equipped with a 5.7-liter V8 engine. But what if going to a larger engine was as simple as just plugging in more cylinders? Chrysler's electric drivetrains will work something like that. To hold more battery power, larger vehicles will simply get more battery cells. The cells themselves will be exactly the same whether in large or small vehicles. That's important because batteries are the biggest expense of creating an electric car. "The real economy is in the cells," said Rhodes. Likewise, the electric motor will be the same. It will just be up-sized for bigger jobs. "All we change is the length of the rotor and the number of windings to span between different power outputs," Rhodes said. Even the housing that goes around the motor will be same regardless of the size of the motor . The magnesium housing will be so lightweight that it simply won't be worth the added cost of creating smaller housings for the downsized motors, Rhodes said. Electric cars aren't just a side-show or a public relations move for Chrysler, Rhodes insists, but a major strategic move. Through its GEM (Global Electric Motorcars) subsidiary, Chrysler already claims to be the largest seller of electric vehicles in the U.S. But those are so-called "Neighborhood Electric Vehicles," ultra-light cars with a top speed limited to 25 miles per hour. Chrysler claims sales of 40,000 GEM cars over the last 10 years. With its new plan, Chrysler plans to produce over 500,000 electric vehicles by 2013. "This is going to be a big deal for Chrysler," he said.